Here’s the quick wrap-up on the National Cherry Blossom Kite Festival. The day started out chilly, and the wind was near dead. However, the sun came out and the wind blew well by the end of the day. Chrooke, Skyamese, Lady Vader, the Tattooed Lady, Kalika, Complex, Bryan, and Nancy all attended. 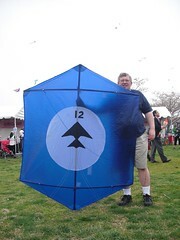 Chrooke entered his logo rok in the kite-making competition, and got compliments on how well it flew. Complex and Chrooke flew in the rokkaku battle, with Kalika catching and Bryan judging. The first heat was disastrous, but we got a couple points back in the second heat. Finally, Chrooke piloted an amazing third heat that took the team from nothing to third place.